Sportbet: A Trustworthy but Dated Sports Betting Site? Sportbet, a sister site of 5Dimes, has been providing sports and race bets to punters since 1997. Upon the site’s launch in the ‘90s, it was one of the few gaming sites that provided betting markets with reduced juice for sporting events around the globe. Unfortunately, not all punters are welcome to this sportsbook. Anyone living in certain countries like the UK and Russia is not allowed to create an account with the site. You can see the list of restricted countries in the Rules and Regulations page. With Sportbet being one of the longest-standing betting sites, can it still give a sports betting experience way better than other sportsbooks can? Read on to know more. One of Sportbet’s strong points is its unique Bitcoin sportsbook bonus promos. While other online bookies will give you a generic welcome bonus or cashback on certain bets, this betting site goes above and beyond with three promos. Here is more information on these bonus deals. Parlay bets or accumulators are a treat with the Super Saver Bonus Program. This bonus ensures that all your accumulators get a 30% discount and -107 styles pricing for popular betting markets such as NFL game spreads, MLB game totals, or boxing money lines. Just note that the program does not apply to the site’s Progressive and MultiChance Parlays. To get a good grasp of what the bonus can give you, you should know that the standard accumulator payouts for bets on four teams is usually 12.28/1. While competing sportsbook will give you a payout of 10/1 for this bet, Sportbet will give you 13.01/1 instead. Juice is a term for the cut that a bookmaker takes for each bet a punter makes. Bets with less juice are ones from which you get the best value. With Sportbet’s program, bets have reduced juice. This program covers straight wagers offered on the day of the game or match. You can find the listing of all reduced juice bets under the Straight & RIF tab in the desktop or mobile sportsbook client. This type of bets ranges from US$1 to US$500 and are not available for Parlays or Rolling If Bets. 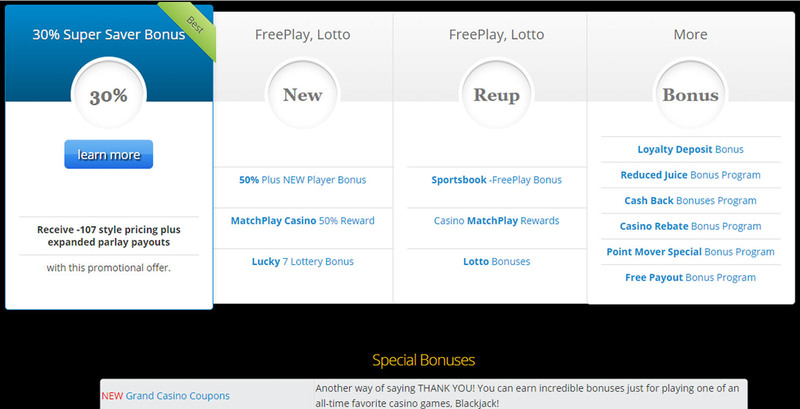 You can get a 20% free-play bonus up to US$500 when you reload your account. To get this bonus, you need to reach a support staff via live chat, email, or toll-free hotline within 24 hours after making a deposit. Take note that the bonus does not automatically gets credited to your account. You need to wager your deposit amount about 10 times first to get the full bonus amount. With the exception of the Free-Play Bonus, the Super Saver Bonus and Reduced Juiced programs are good reasons to make bets with real money in this sportsbook. The discounted parlay and straight bets provide better value for your money than bonuses that you need to bet for a number of times just to cash out your winnings. 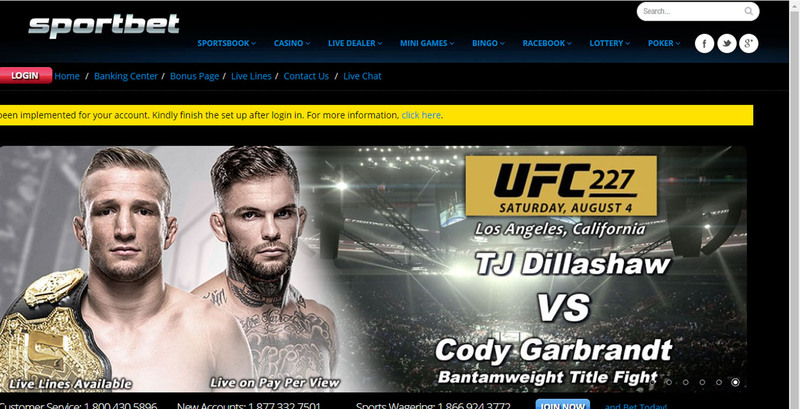 The Sportsbook section of Sportbet is the weakest part of the sportsbook because of its dated interface. Browsing the different bets available for a specific game requires many mouse clicks because the markets are categorized by the bet types and not on the sports or games. The layout can turn you off, especially when you know that there are other sportsbooks that have a modern interface that presents to you every bet available for a specific game or tournament on just one page. On the other hand, the sportsbook coverage is decent with betting markets available for more than 10 different sports and competitive matches. In this sportsbook, you can find markets for NBA Playoffs games and other major basketball matches. Outside of the usual sports, there are also motorsports bets for Formula 1 and NASCAR races. In addition, the betting site provides various wagering types including straight, totals, handicaps, and in-play wagers. Sportbet takes in major credit cards and e-wallets as payment methods. The site also accepts crypto coins and allows you to cash out your bankroll through your Bitcoin wallet. While there are many options for you to fund your account, the minimum deposit amount of US$50 can be too much for certain punters. Other sites will let you fund your account for as low as US$1. Fiat withdrawals are processed from Monday to Thursday while Bitcoin cash-outs are processed throughout the week. 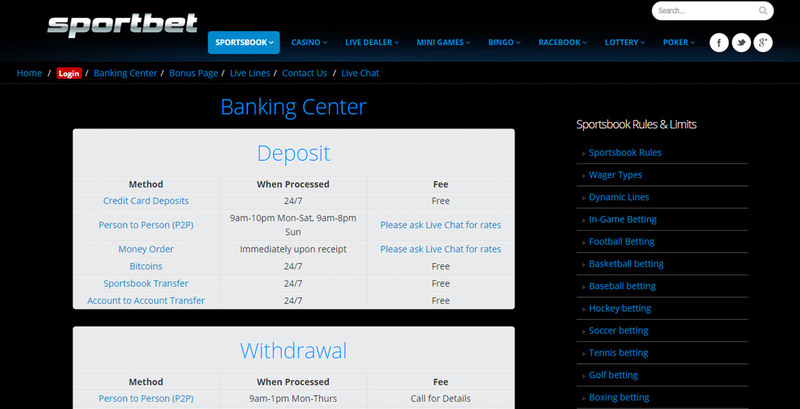 It is good to see a sportsbook that can give you a large variety of payment options. But the large minimum amount for both withdrawals and deposits are a big downside for this gaming site. Sportbet: Is It Worth It? The two bonuses are the main reason to visit this sportsbook. It is uncommon to see a sports betting site offering markets with better prices and payouts. But although you will enjoy the bonuses as long as you fund your account, these bonuses apply only to parlay and straight bets. The other shortcomings of Sportbet are its inconvenient sportsbook layout and large minimum payout amounts. If you don’t mind these issues and are more concerned about your account’s security, this sportsbook may be worth your bets. Otherwise there are other Bitcoin sportsbooks for you to check out.